Managing a handful of training courses that you offer stateside a few times a year may not set your budget back, but if you’re offering dozens of classes multiple times a year in cities across the globe, then exorbitant print production costs should raise a red flag. Manufacturing capability to produce high-quality student guides, lab guides, bound copies of course notes and other training materials, such as DVDs. Sufficient equipment (redundancy is a must) to accommodate all of your courseware needs, especially in times of high-volume printing and shipping. A secure online portal that houses all of your course materials in multiple languages. A portal that offers seamless ecommerce functionality. 24/7 tracking and reporting functionality for all courseware printed and shipped. A portal that gives your team the ability to customize and edit courseware as needed. A print and fulfillment partner that offers local printing and shipping for the countries in which you do business. Here’s why: shipping costs will be sky-high if your printer prints course materials in North America and ships them overseas, especially in the countries that are most popular for high-tech training, including China, Saudi Arabia, India and Europe. Aside from preventing logistical nightmares if your print materials are shipped outside of North America, you’ll save thousands and thousands of dollars by working with a partner who has a global network of printing and fulfillment facilities worldwide. You get peace of mind. 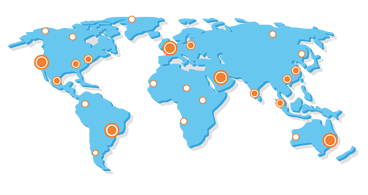 A global distribution network. And extreme savings. Get in touch and find out how much we can reduce your current costs for all of your training materials.